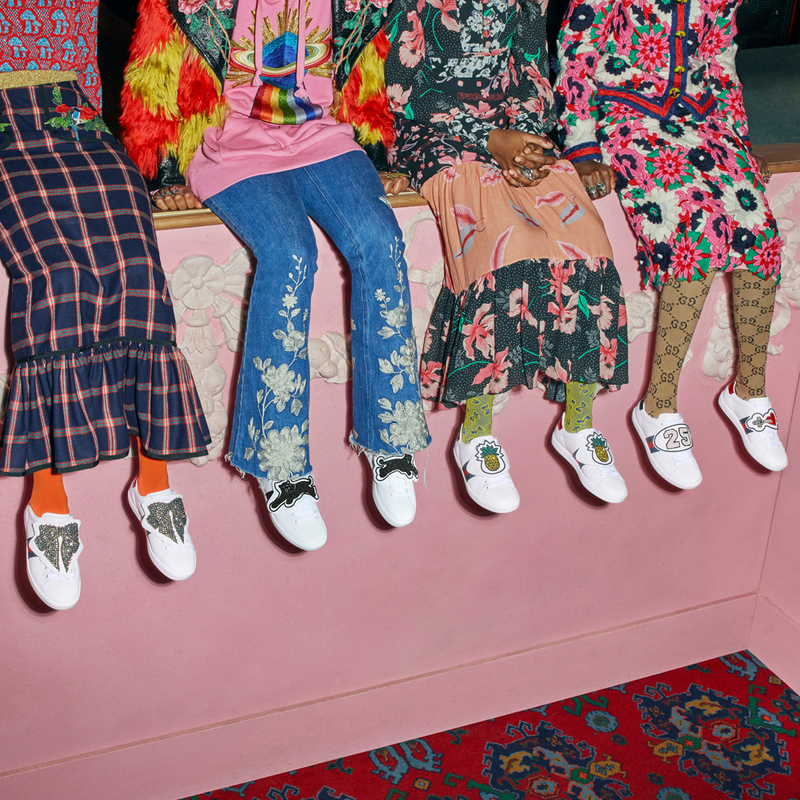 At Gucci, the desire to promote self-expression has led to the development of a comprehensive programme of personalisation and customisation initiatives. Now this concept has been extended to the House’s celebrated Ace sneaker, which has been developed to allow the application of detachable patches. For Pre-Fall 2017, the iconic white Ace is introduced in six new styles for women, and five for men, with interchangeable patches that attach using snap buttons. Pairs are purchased already featuring patches and can then be customised by acquiring additional ones from a range of 9 add-ons. A single pair of shoes can be transformed into a canvas with over 100 patch combinations. For women, there are six models featuring eccentric patches in either thread or crystal. Patches displaying the cat, ‘Blind for Love’ expression, pineapple, crystal panther and flamboyant fumé crystal bow feature on five pairs, while a sixth displays a patch with the number 25 on one shoe, combined with the motif of the beaded heart pierced by a sword on a patch on the other. All patches echo design details found in the Spring-Summer 2017 women’s collection. For men, there are five new styles with detachable patches: in thread, there is the ‘Blind for Love’ expression, the iconic Gucci tiger head, the cat, and the UFO, which is coupled with a dragon for the other shoe in its pair; a panther is also available, but unlike the women’s style, it comes in terry material. In both women’s and men’s styles the back of the heel always comes in laminated snake skin – blue on the right shoe and red on the left. All models are sold with specially designed packaging: black satin dust bag displaying a yellow Gucci logo per shoe; black tissue paper, boxes and bags feature an all-over multi-coloured ‘rainbow’ stripe. Boxes are sealed with a decorative black grosgrain ribbon, branded with tone-on-tone Gucci logos, which is tied with a bow. In addition to the pre-determined patches that come with these Ace’s, nine detachable crystal or beaded patches for the women’s styles and nine detachable thread or crystal patches for the men’s can be purchased individually to truly customise the sneakers (including the panther in crystal, for men). Each additional patch is sold separately, and is wrapped in a way that is complementary to the packaging used for the shoes. For women, the extra patches are: two different bows, the flower, the snowflake, the eye, the bee, two feline heads (the tiger and the cat) and the ‘Love’ script with the rainbow. For men, the extra patches are: the beaded heart pierced by a sword, the tiger head, the pearled number 25, the pineapple, the cat, the panther, the bee, the eye and the owl head. Finally, for men the Ace is now also available in a high-top version with patches. Here, again the patches are detachable. The high-top Ace comes in two versions – one with the iconic tiger head on the patches on both shoes in the pair, and another, more flamboyant style, with the blue cat patch on the front of each shoe in the pair, and another removable patch with the word ‘GUCCI’ written in studs attached to the back of both shoes. For both styles, the back of the heel always comes in laminated snake skin – blue on the right shoe and red on the left. These high-tops are sold with dedicated packaging that mirrors that used for the low-top Ace sneakers.